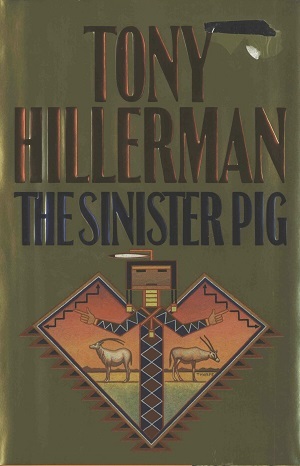 This is the first edition of The Sinister Pig, which is the sixteenth Tony Hillerman Navajo Mystery novel featuring Jim Chee of the Navajo Tribal Police and a now retired Joe Leaphorn. This edition was published in 2003 by HarperCollins Publishers Inc. in New York City, New York. The cover art was designed by Peter Thorpe, who designed a majority of the American covers. This edition's cover features Yeii figure with outstretched arms and two oryx, exotic gazelle from Africa and the Arabian Peninsula, grazing on either side. Format: Hardback, 235 x 16 cm. Binding: Tan boards with a royal blue spine and the title, author, and publisher printed vertically in gold on the spine.